NEW CONSTRUCTION in this beautiful resort like golf subdivision called Elkins Lake! 3 bedroom home, bonus room upstairs, pocket office off kitchen, open concept living area, amazing floor plan and interior appointments! This combination of stone, brick and siding creates an appealing facade to complement any neighborhood. Inside, the dining room is defined by columns and features a trey ceiling. A fireplace warms up the great room w soaring ceilings, provides access to the rear deck. Kitchen has gas cook top island and extended counter space make meal preparation simple and organized. Cabinets are distressed gray with soft close. Secondary rooms share a full bath. Master bathroom has double-bowl sinks, His and Hers closets, huge walk in shower. The utility room is located near the garage entrance. Tankless Water Heater, water and scratch resistant floors, 16" rain head in master shower, Fridgedair appliances, insulated garage doors, exterior retaining wall along left side of home. SchoolsClick map icons below to view information for schools near 1447 Greenbriar Dr Huntsville, TX 77340. Listing provided courtesy of Land Home and Ranch Realty. Home for sale at 1447 Greenbriar Dr Huntsville, TX 77340. 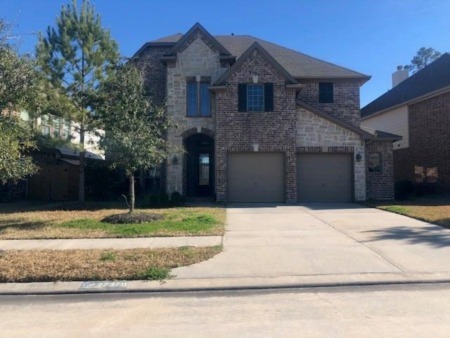 Description: The home at 1447 Greenbriar Dr Huntsville, TX 77340 with the MLS Number 95021889 is currently listed at $289,000 and has been on the Huntsville market for 69 days. You are viewing the MLS property details of the home for sale at 1447 Greenbriar Dr Huntsville, TX 77340, which is located in the Elkins Lake - Sec 1 subdivision, includes 3 bedrooms and 2 bathrooms, and has approximately 2142 sq.ft. of living area.